IN THE SIXTH MONTH of her elderly cousin Elizabeth’s pregnancy, a young, betrothed Jewish girl was astonished by a visit from an angel. It was the angel Gabriel, and he greeted the girl Mary with a reverential “Hail” and announced that she had “found favor” with God and was to conceive and bear a child to be called Jesus. Shocking enough; but there was more: the conception would occur not by natural means, but by the agency of the Holy Spirit (Luke 1:35-37). Mary responded in obedience. She called herself the Lord’s “handmaiden” (Luke 1:38)—a humble title that set the tone for the rest of the New Testament accounts and became the foundation for centuries of Marian devotion. Mary recognized that she had become, like Enoch (Gen. 5:22) and Noah (who “found grace in the eyes of the LORD” [Gen. 6:8]), one “highly favored” by God (Luke 1:28). She saw that she would forever after be recognized as one “blessed among women” (28, 42). This blessing was not for her alone, as she sang in her Magnificat (Luke 1:46-55), but for all God’s children. She was the one woman, out of all women, through whom God would fulfill his covenant love and promise. How improbable! This obscure Jewish girl became, through the work of the Holy Spirit and her willing obedience, the instrument of divine grace. Through her, the majesty and unapproachable holiness of God joined the frail impermanence of fallen humanity. She was the chosen vessel of the Incarnation, at the pivot point of God’s saving plan. How could Mary not loom in the imagination of the church? Although Mary the mother of Jesus is of almost unrivaled importance in historic Christianity, and although her role in salvation history is central, she has a comparatively modest role in the Bible itself. Even where Mary does appear in the Gospels, she often has only a cameo, and in several instances, she does not even get a speaking part. The gaps and silences in the biblical texts have invited speculation, and writers of a number of apocryphal books (p. 18) purport to reveal details of her biography not found in the canon, inspiring much art and even some doctrine. The central importance of Mary in Christian tradition, however, is rooted in the Bible. It is in her role as the “mother of Jesus"—or, in Elizabeth’s words, “mother of my Lord” (Luke 1:43)—that we meet her in the Gospels’ pages. Luke, of course, tells her story most fully (1:26ff; cf. Matthew 1:18ff). There we find not only Gabriel’s Annunciation to Mary, but also her poetic response, the prayer-song known as the Magnificat (because it begins “Magnificat anima mea Dominum” or “My soul magnifies the Lord"). Mary’s Visitation to Elizabeth, whose fetal child John the Baptist “leaps for joy” in her womb at Mary’s approach (1:39-56), completes the story of the Annunciation. Along with Gabriel’s Ave Maria and Mary’s Magnificat, the Visitation confirms that the events Mary is caught up in are indeed God’s fulfillment of “all that the prophets had spoken.” Not surprisingly, along with the plethora of artworks dedicated to the Annunciation, Christian artists have created many images depicting this portentous visit. Because of the doctrine of the Incarnation, Mary is associated with the fulfillment of the Word of God and thus with Scripture. In many Renaissance paintings the Angel Gabriel finds her reading the Bible. It is historically unlikely that Mary would have had access to a scroll of Torah. Yet artists seeking to symbolize her faithfulness pictured her as a careful student of the Word of God. This attentiveness to God’s written Word was not only a sign of her obedience, pious artists thought, but also a preparation for her coming role as the receptacle for his Word made flesh in Jesus. Moreover, Mary’s supposed study of Scripture would make her a model for all those who would seek to harbor Christ in themselves. So, in Roger van der Weyden’s (ca. 1400-1464) Annunciation, Mary’s bedroom is imagined as a church sanctuary, and her hand is shown raised over the Bible. This makes visual her verbal words of faith and obedience: “Be it unto me according to thy Word” (Luke 1:38). Following this line of thought, Thomas Aquinas (1225-1274), among others, spoke of Mary as the model and patron saint of all those called to study Scripture. No painting of the Annunciation captures this theme so well, perhaps, as that of Robert Campin (1375/80-1444), sometimes called “The Master of Flemaille". We see Mary seated on the floor rather than on the bench, absorbed in reading Scripture. Another book, perhaps a commentary, lies on the table beside a kind of book bag and some notes. Behind her hangs the talit, or prayer shawl— presumably of her father Joachim. The vase on the table holds a lily; on it are visible Hebrew letters; the vase symbolizes Mary’s virgin womb. The angel Gabriel has just entered the room; the beating of his wings has snuffed out the candle, and Mary is captured, by the painter’s brilliance, just as she is beginning to shift her eyes toward Gabriel. Intent upon the Law, she is about to be surprised by Grace. The Scripture cradled in her arms has its binding protected by a cloth, an allusion to the swaddling cloths in which she will wrap the newborn Jesus: this touch renders powerfully transparent the link between the Word and the Word-made-flesh. Christians seeking links between Jesus’ birth and Old Testament prophecies focused early and often on Mary’s unprecedented virgin conception (cf. Luke 1:34). In this, they followed the New Testament sources. Matthew, in his telling of Jesus’ birth (1:22-23), brings the promise in Isaiah to bear on Jesus —"Behold, a virgin shall conceive, and bear a son, and shall call his name Immanuel” (7:14). The virginity of Mary became one of the crucial tokens for early believers that Jesus was “the Christ” long expected. Christian readers of the 1st century would have expected Mary herself to be about 12 years of age—the age ascribed to her by two apocryphal gospels and the common age of betrothal. Mary’s youthful virginity was nonetheless theologically important, as was her lineage as a scion of the root of Jesse, the house of David. These matters, along with the spare canonical narratives, gave rise to apocryphal accounts of her childhood and parentage. References to Mary are in other respects slight in the first centuries of the Church. From the time of Irenaeus (d. A.D. 200), Christian apologists combated gnostic heretics by pointing out Mary’s significant place in salvation history. This allowed them to clarify the biblical case for Christ’s human as well as divine nature, over against the gnostics’ spiritualizing of Christ. The formula offered by Irenaeus, that Mary is a “second Eve,” becomes standard in Marian literary typology. In 2nd-century frescoes from Roman catacombs, we see Mary represented as the fulfillment of the “virgin” in Isaiah 7:14. Such representations amount to a statement about the two natures of Christ and the purity of his birth—a statement verbalized and made binding in the Apostles’ Creed, the Chalcedonian Council, the Old Roman Baptismal Creed (Hippolytus), and the Niceno-Constantino-politan Creed (A.D. 381). Later controversy concerning Mary’s role led to various attempts by the Fathers to clarify her specific virtues. Virginity was already a high ascetic ideal for Jerome (340/2-420), Ambrose, and Augustine (354- 430), each of whom readily celebrated Mary as the premiere example of virginity as a spiritual vocation. Jerome wrote his influential De perpetua virginitate Beatae Mariae adversus Helvidium (A.D. 383) as a reply to Helvidius, who maintained that mention in the Gospels of the “sisters” and “brethren” of Jesus, as well as the statement that Joseph “knew her not until she had brought forth her firstborn son” (Matthew 1:25), suggests that the virginity associated with Jesus’ conception and birth had evidently given way subsequently to a normal marriage relationship between Mary and Joseph. Concerned that such a view might rank virginity lower than matrimony, for Jerome an impossible reversion to the patriarchal system of the ancient Hebrews, he uses the Pseudo-Gospel of Mary and the Protevangelium of James (ca. 180) to argue three positions that subsequently became central to Marian literature: (1) that Joseph was only apparently, not actually, the husband of Mary—in particular, that he was elderly and remained a virgin (3-8); (2) that the “brethren” of the Lord were actually his cousins, children of another Mary, the wife of Cleophas (9-17); and (3) that virginity is spiritually preferable to wedlock, which entails many hindrances to prayer. Since very early in the history of the church, Christians have dwelt devotionally on Mary’s virginity— often insisting that that virginity was never violated throughout her life. Like other Marian themes, this one had its heyday in the medieval period. Anthony of Padua (1195-1231), who saw Mary as the natural human channel for devotion to the Passion of Christ, championed and codified the idea of the “virgin bride"—a common theme in medieval iconography. 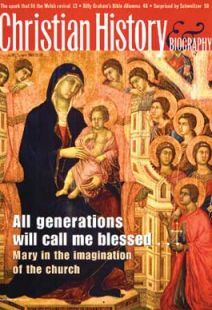 Anthony found “types” of Mary’s perpetual virginity in many places in Scripture: the burning bush of Moses that burned without being consumed (Exodus 3:2); the fleece of Gideon that, as a sign of God’s election, remained untouched by the night-time dew (Judges 6:37-38); and the “closed gate” of Ezekiel 44:2, which after being entered by “the LORD God of Israel” was never again to be used. Anthony also found Mary’s virginity prefigured in the mountain from which, without hands, is hewn the little stone that destroys the empires of this world (Daniel 2:34) and the “rod out of the root of Jesse” (Isaiah 11:1) which, like Aaron’s, miraculously blooms. Bernard of Clairvaux (1090-1153) had written, in his commentary on the Song of Songs and in a Marian hymn, of the “rosa sine spina"—the rose without thorns. After Bernard, this became as frequent a symbol for Mary’s loveliness as the lily was for her purity (as the medieval carol goes, “A roose hath borne a lilly white"). Finally, in one of the most important papal announcements of the Middle Ages, the “Unam sanctam” of Pope Boniface VIII (1302), Boniface made the bride of Song of Songs 6:8 stand officially for Mary as representative of the church, thus coloring and amplifying much of the other typology. A number of venerable beliefs about Mary originate in a little-known book. Even those who know little about the veneration of Mary in church history have probably encountered a number of beliefs about her that can’t be found in the gospel accounts: the names of her parents, for example, or her supposed “immaculate conception” (birth without sin). Many of these come from a single source: the Protevangelium or Gospel of James. Although rejected as uncanonical in the 6th century, this book provided the material for many of the most important medieval legends, artistic representations, and ultimately theological beliefs about Mary. A Jewish-Christian work of the 2nd century, it is an infancy narrative with extensive elaborations attesting to the sanctity and special powers of Mary. “James” tells the story of how Mary’s parents, Joachim and Anne, childless in their old age, were blessed by the birth of this special child. If the story has a familiar ring, it is because it closely parallels the biblical account of Isaac. The Protevangelium also portrays Joseph as an old man, a widower with grown children, at the time of Mary’s espousal to him. Recognizing, her extraordinary purity and set-apartness, Joseph becomes more of a caretaker than a husband to Mary. A number of early church fathers, including John of Damascus and Sophronicus, cited or commented on this account of Mary’s conception, birth, and life, and it evolved during the Middle Ages into various other Lives of Anne. Other apocryphal gospels contributed material, including the “Mary” Gospel of Pseudo Matthew. These narratives focus on Anne’s childlessness through 20 years, at which point Joachim became a recluse, for shame. The couple’s prayers were eventually answered: an angel appeared to each individually, promising a child who will become known to the whole world. Joachim and Anne were reunited at the Golden Gate (the subject of a painting by D¸rer), and eventually the child Mary was born. In the Protevangelium, the story resembles that in I Samuel 1, concerning the barren Hannah, whose prayer for fruitfulness is likewise answered ("Hannah” and “Anna” or “Anne” are variants of one name), and Mary is similarly sent up to the temple to be raised as a virgin (an historical improbability), there to help weave a new veil with “true purple,” the royal color. This view, though often challenged, has had notable champions. In refuting Pelagius, Augustine is among those who declares that while all those justified by grace have known sin, he cannot, “for the honor of the Lord.” even question whether Mary might have sinned (Nature and Grace, 100.36). The term “Immaculate Conception,” relating strictly to Mary’s own conception, appeared in the formal liturgy first in 1854 (Pius IX), though the feast was adopted for the entire Latin church in 1476 (by Sixtus IV). Since Christ stands alone as our redeemer, what is Mary’s role? In his work Against Heresies, Irenaeus developed an idea called “recapitulation,” based on Paul’s words to the church at Ephesus: “To bring all things in heaven and on earth together under one head, even Christ” (Eph. 1:10, NIV). Christ, said Irenaeus, recapitulates the first Adam and replaces sin and death with righteousness and life (see Rom. 5:12-21). Perhaps evangelical Protestants need to recognize Mary’s rightful place. Certainly she is not the coredeemer, but with Mary’s “May it be to me as you have said” (Lk. 1:38), an act of obedience undid the disobedience of our first parents. So with Elizabeth, evangelicals cry, “Blessed are you among women, and blessed is the child you will bear” (Luke 1:42). This confession is more than a Protestant neglect but less than the profession of those Catholics who would make her the co-redeemer. Perhaps it is even biblical. David Lyle Jeffrey is Distinguished Professor of Literature and the Humanities and Provost of Baylor University.